You’ve heard that we know more about space than we do the deep ocean. But did you know it’s so unexplored that scientists discover new species just 200-500 feet down, sometimes at a rate of 14 an hour? A (sort of) manmade enemy threatens those efforts though, and they can’t kill, study, and eat it fast enough. In every direction, things are getting legitimately intense. To the side, the submarine’s depth meter clicks toward the 500-foot mark. Above, condensation pools and drips as the tiny sub sweats out its temperature-change. Below, a vertical canyon walls falls away into blackness, its scale so vast that it threatens to overwhelm the brain. And in front—just on the other side of a gleaming, convex bubble-window that pushes into the dark—four figures cling to the sub’s collection basket, surreally lit by the glare of the vessel’s external lights. They’re all members of the California Academy of Sciences’ “twilight zone” deep-dive team, and they’re headed for a five-hour shift in one of the most mysterious—and critical—ocean layers on Earth. Sub rides aren’t the norm for this crew (in the increasingly underfunded world of scientific exploration, subs aren’t really the norm for anyone), but since a quicker-than-normal descent could give them a few extra minutes at today’s 450-foot max depth, they’re giving it a shot. Called the Curasub, the five-person craft belongs to Adriaan “Dutch” Schrier—a former deep-diver who owns Curaçao’s Royal Sea Aquarium Resort, grounded a sister-ship of Cousteau’s Calypso to serve as his office, and has built more islands, kept more secrets, wooed more women, sweet-talked more dolphins, and risked more death than anyone you know. Fortunately, the guy who looks uncannily like this also has a passion for advancing marine science, which explains why the Academy team—along with the Smithsonian’s Carole Baldwin and Cristina Castillo, both tucked into the sub beside me—are watching Curaçao’s famous turquoise waters turn a blue so deep it hums. The environment they’re out to study is a band of ocean between 200 and 500 feet that’s properly called the mesophotic. Don’t know anything about it? Neither does anyone else. It earned its “twilight zone” nickname not just because you say a slow, heart-pounding goodbye to the light as you descend into it, but because its deep coral reefs, incredible biodiversity, and the ways those reefs are intertwined with the health of Earth’s shallower reefs (i.e. the reefs you know and love; the reefs that support at least 25% of all marine life and have experienced massive die-offs since the ’70s) are mysteries we need to understand. The team chips away at those questions each time they drop—discovering new species at rates as high as 14 per hour, for example—but today they’re hunting a well-known quarry: the invasive, venomous lionfish. On this dive, Rocha and Jessup—along with Academy aquarium director Bart Shepherd and PhD student Hudson Pinheiro—are collecting as many lionfish as possible for stomach-content analysis and DNA testing. They want to know what native species the lionfish are eating (which will give them a sense of how food chains are being impacted), and whether twilight-zone lionfish are part of (or entirely separate from) the shallow-water populations. If the two groups are connected, then Caribbean countries’ current efforts to contain the lionfish problem—which usually amount to encouraging local divers to spear all they can at recreational depths—may need to be revisited. Rebreathers have to constantly balance a diver’s system by adding both oxygen and diluent—a mix of mostly helium and nitrogen that prevents the O2 from getting overly concentrated (and makes serious scientists sound like enraged chipmunks when they talk-yell to each other underwater). Hypoxia lurks on one side of the equation, hyperoxia waits on the other, hypercapnia skulks everywhere in between (all potentially deadly), and because of the amount of inert gases being absorbed into the divers’ tissues—onboarding that’s exponential the deeper they go—coming up from those depths is a mercilessly slow process involving four or more hours of decompression. And with every minute at max depths carrying huge additional decompression penalties, the team has to work quickly, but also slowly, since physical exertion promotes the absorption even more gas and oh, by the way, could lead to a lethal CO2 build-up. Finally, they have to be ready to solve each and every problem, from equipment to physiological, without surfacing, which is why in addition to being loaded with backpack-style rebreathers, they’re also each clipped to multiple tanks of bailout gas—different mixes for different depths. “Bailout” is kind of a misnomer here, since any quick ascent would actually kill you, but being able to switch to these backup open-circuit rigs should let them survive decompression in the event of a rebreather failure. “My mother hates that I do this,” says Shepherd. What I’m hearing you say right now is that you suspect people who spear this many lionfish scientifically must pretty good at it. And that you didn’t get enough submarine. And that those things probably deserve an almost unbearably dramatic soundtrack. I think that seems fair. 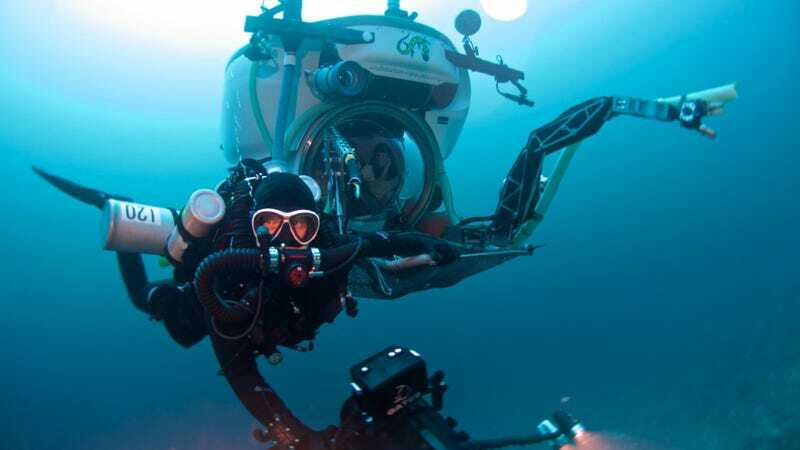 Underwater images by Bart Shepherd, rebreather photo by Luiz Rocha, video by Elliott Jessup.